What are Steel Tubular Piles? Steel Tubular Piles are large hollow tubes which are driven or vibrated into the ground with the use of a Movax vibro hammer, or other efficient modern accelerated hammers. They can be supplied as a single length, or in sections depending on the project requirements. There are a wide range of pile sizes available to cater for any application. Screwfast have comprehensive experience in their design. 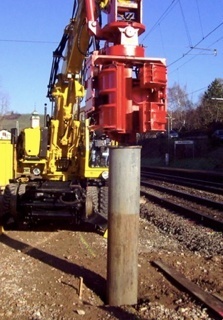 Steel driven piles can be installed rapidly and loaded immediately since no concrete is required.